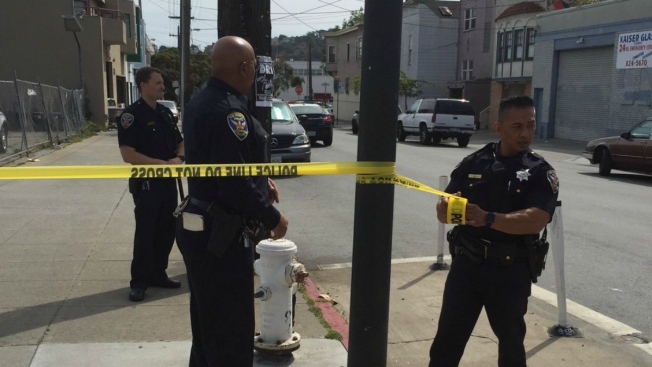 San Francisco police have identified the two officers who fatally shot a homeless man who police said charged at them with a knife. The San Francisco Chronicle reports Sgt. Nate Steger and Officer Michael Mellone were identified by a department representative as the officers who opened fire on 45-year-old Luis Gongora on April 7. San Francisco Police Chief Greg Suhr said during a community meeting last week that the officers feared being stabbed by Gongora. In video footage of the shooting three uniformed officers are seen arriving, walking off screen and commanding in English for Gongora to drop to the ground. About 30 seconds later, the sound of a bean bag gun being cocked and fired can be heard immediately followed by seven gunshots.